1) Candy. By far the most popular one. They answer the question correctly, they act out in a story, they share what they did over the weekend, etc. All deserving of a piece of candy. When participation is very low, I pull out a bag of candy and all the hands go up. Maybe I got myself into a trap but I don’t mind rewarding with candy. 2) PAT (Preferred Activity Time). CLICK HERE to see two PAT games. Classes get points for good participation, speaking Spanish, having all materials ready, good reading, etc. 1 point = 1 minute. Every Friday is game day and we play their favorite game for however many points/minutes they have earned. 3) Scratch off Spanish tickets. CLICK HERE to see my post about this. 4) Teacher vs. the Class. I have a tally on the board. One column is profe and the other column is clase. Every time the class speaks English or is off task they get a tally. Every time I am speaking English or off task, I get a tally. Whoever has the least amount of tallies, wins. The class decides what the prize is. Here are some previous prizes: nachos with salsa, I do something crazy in the hallway, watch a movie. Here are some of the things that I have done when I won: give them a quiz, have them do a translation. 5) Spanish student of the month. 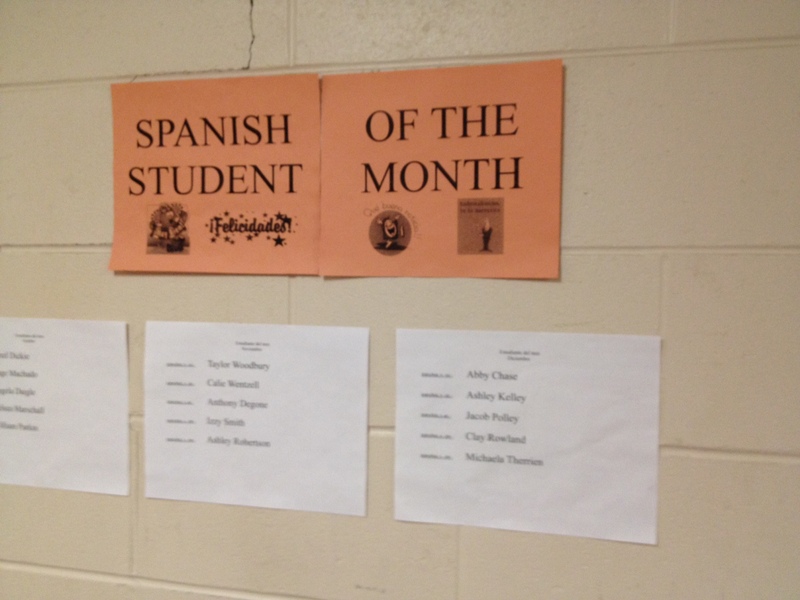 Each month I pick one student per class to be the Spanish Student of the Month. I post the names outside my classroom on the wall for everyone to see. What kind of awards/incentives do you do that have been successful?